Record only the “aha moments” from your conversation that caused you to think, “Gee, I should write that down”.
. Relax, actively listen and stay engaged in the conversation.
. Never miss key ideas and non-verbal cues by stopping to take notes.
. 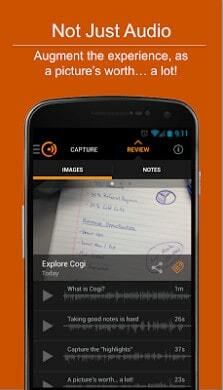 Enjoy superhuman recall as Cogi records the important ideas from your conversations.
. No limits on recording time. Review only the important highlights from conversations without listening to the entire meeting or lecture again.
. No time wasted reviewing hours of recorded lectures and meetings nobody wants to listen to again.
. Add contact tags for each person in the meeting to solidify key takeaways.
. Add pictures from the whiteboard along with the audio highlights to help you remember the ideas.
. Use as call recorder for those important calls.
. Capture meeting minutes by transcribing your voice notes.
. Record phone call interviews, capturing key sound bites.
. Record and transcribe class notes or lecture notes.
. 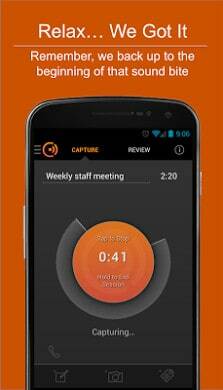 Replace physical notebooks and notepads.
. As a call recorder, capture both sides of the call. Cogi is looking for help with translation into other languages. If you would like to help with your native language, please contact us at feedback@cogi.com.